One of the joys for me of living with neighbours of a different race is that I get to learn about their culture and the food that they eat. 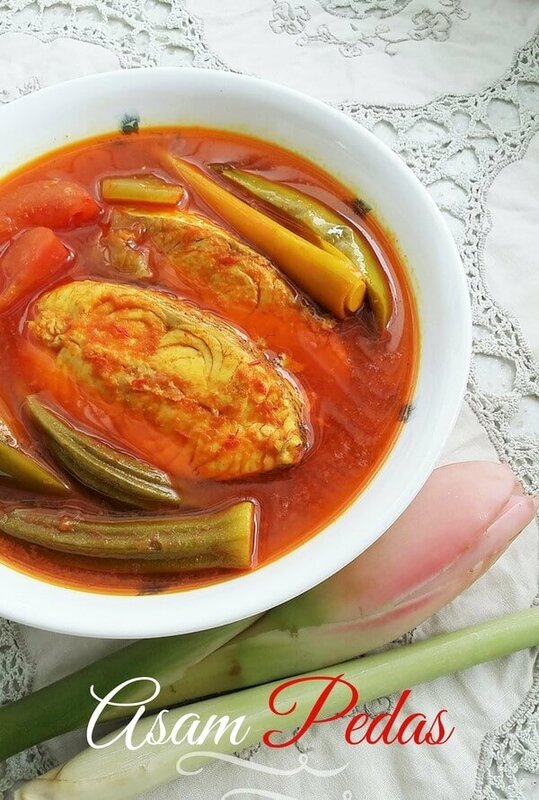 My nearest neighbour, who is an Indian, cooks curries almost every day and was the one who first introduced me to this fabulous Malay curry called Ikan Asam Pedas (Spicy Tamarind Fish). One spoonful of the curry stew and I was instantly hooked. Spicy and sour, it was soo appetizing that I practically drank up the curry like a soup and had a second helping of rice; something which I rarely do. I knew I had to get to the bottom of this Asam Pedas recipe! A classic Malay dish, there are many versions of Asam Pedas as different cooks make their own interpretation of this dish. While this dish is very popular in Malaysia and Indonesia, its exact origin is unclear. Different spices (eg. addition of bunga kantan, laksa leaves, black pepper, etc) and types of fish may be used but the end result is always the same. Spicy and tart. And that’s the way I love my curries. Popular choices of fish for this dish include red snapper, ikan pari (stingray), tenggiri (mackerel) and angoli (gold band snapper)and white pomfret. You can use the fillet, tail, head or slices of fish cut thickly. The picture below shows the ingredients to make the curry paste. Please refer to the recipe for the quantity that I used. If you make a bigger batch of the blended paste, it can be refrigerated for about a week and longer in the freezer. So, anytime when you have a craving for Asam Pedas, you have your paste ready to fry. It will save you some preparation time and that is really convenient when you want to whip up this dish quickly on a busy day. Do all the preparation work for the ingredients so that the cooking process will be much smoother. 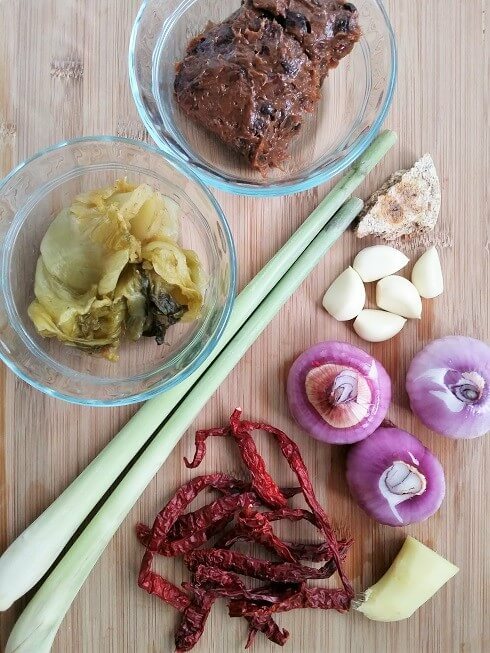 Clockwise from top: Asam (tamarind paste), belacan, garlic, red onions, dried chillies, lemongrass and salted vegetable. See the flower that is beside the Asam Pedas dish on my main picture. Called bunga kantan (torch ginger flower), it is not merely an ornamental flower but is used in many Asian dishes such as Penang asam laksa, rojak (a popular fruit and vegetable salad dish), sauces and curries. Some recipes call for this torch ginger flower to be used in this dish. Personally for me, I find that its flavor would be overshadowed by the lemongrass so I did not use it this time. If you wish to use this flower, slice the bud thinly and sprinkle it into your curry for extra flavor. Discard the stalk. Sometimes I see it sold at the vegetable stalls in a market. However, if you can’t find this ginger flower, don’t fret as your dish will still taste great. Read more about this torch ginger plant here. Usually, when it comes to spices, I prefer to pound it manually (eg. for the Sambal Belacan) but in this case, I find it is more convenient to just blend it as you want the paste to be very fine. Add a little water into the blender before you blend the spices. The chilli paste in this recipe can also be used for other types of seafood like prawns, squid and also poultry. Check out these blenders from Amazon. Fry the paste until the oil separates from the spices. This oil is now perfumed with all the goodness of the spices and will make the dish taste even better. These spices have to be well cooked to bring out their aroma but be careful not to burn it. Stir constantly and keep a close watch. I wish you could take a whiff of the frying in progress now. It is SO good! The smell alone is enough to whet my appetite. I fried all the blended spices in my Happycall Alumite Ceramic Pot; my wonderful kitchen helper. It is a very versatile pot; great for cooking all kinds of dishes from soups, stews to curries. Read about my detailed review on Happycall Alumite Ceramic pots here. Taste and season with some salt and sugar before you add the fish and vegetables. I used ladies fingers, brinjal and tomatoes. Don’t overcook them or they will become very soft and mushy. There are two important things to note when cooking this dish. 1. The spices have to be well fried. This takes about 10 – 15 minutes depending on how much spices you are using. Add just enough water to the curry as too much water will cause the dish to become soupy and mute its fiery heat. 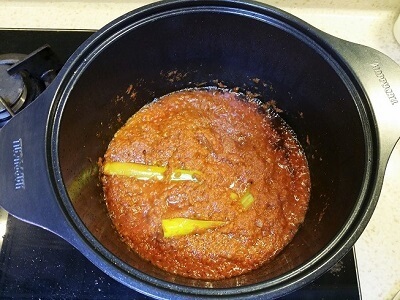 The first time I made Asam Pedas, I used 20 dried chillies and it was too spicy for my children. So, I’ve toned down the heat level this time by using about 14. It is moderately spicy for me but my princess said it is still too spicy for her. Sigh… Feel free to adjust the amount of chilies to suit your preference. The ingredients for this Asam Pedas recipe may seem like a lot but don’t let that deter you from trying out this recipe! If you cook this and plan to make it again, I recommend that you make a bigger batch of the curry paste as it can be refrigerated or kept in the freezer. So the next time, you’ll just have to get the fresh ingredients as you already have your paste. This spicy and sour fish stew is very addictive and appetizing and if you eat rice, I guarantee you’ll be eating lots of rice with it. I hope this recipe is a keeper for you as it is for me. Please share this post on your social media. 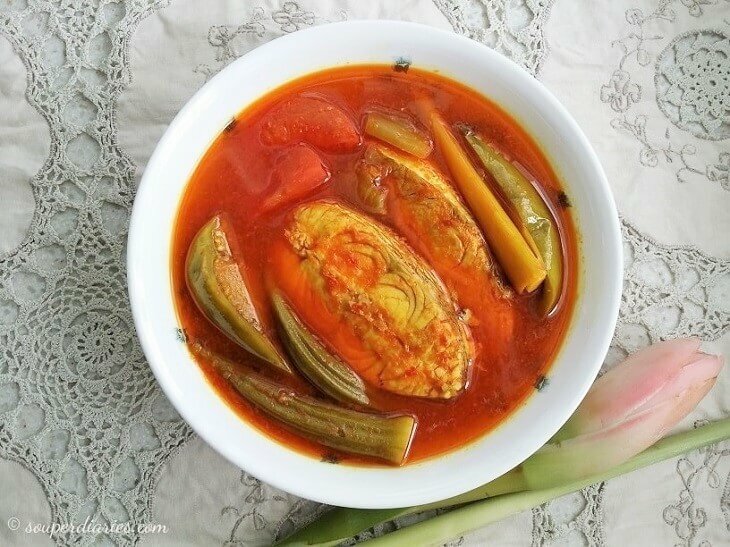 Try this Asam Pedas recipe and let me know what you think. Would you like to stay connected? Subscribe to my newsletter and get the latest updates and new recipes delivered to your inbox. Happy cooking! 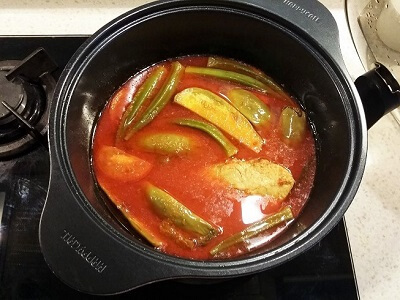 An appetizing Malay spicy and sour fish stew with vegetables. 14 dried chilies - cut each dried chili into 3 sections and boil in a small pot of water till softened. Discard water. To prepare tamarind extract, mix tamarind pulp with 1.5 cups of water. Use your fingers to squeeze and press the tamarind pulp to separate the seeds from the pulp. Strain with a sieve for the juice and discard seeds. Set aside. Heat up oil in a medium sized pot or wok. Fry the blended ingredients over medium-low heat until it is fragrant. Add in lemongrass and stir. Stir continuously and make sure the paste does not dry up. Cover and let it boil for 1-2 minutes. Open the lid. Continue to stir until the chili paste is drier and well cooked. Pour in tamarind water and about 2 - 3 cups (refer to notes) of water. Let it boil. Now is the time to taste and season with some salt and sugar to taste. Add the fish and salted vegetables. Boil for about 2 minutes. Add ladies fingers and brinjal. Cover and boil for about 3 minutes. Lastly, add the tomato sections. Boil for about 30 seconds and turn off the heat. Serve hot with rice. 1. Tomatoes are added last so that it retain its shape and does not become overcooked. 2. Do not overcook ladies fingers or they will become too soft and mushy. 3. Fish meat can be substituted with fish head, fish tail or other types of seafood like prawns and squid. 4. 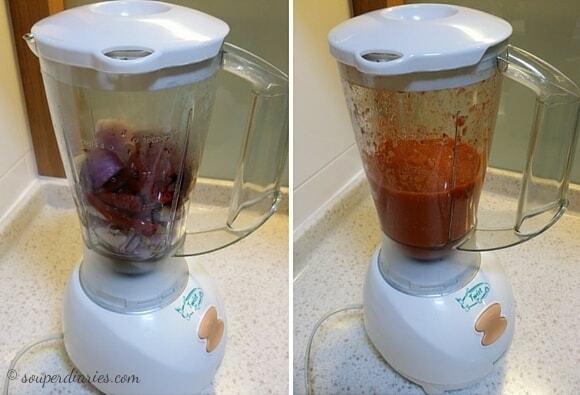 When blending the spices, add some water into the blender or it will be difficult to blend. 5. Adjust the amount of water to your own preference. Use more water (but not too much or it will be too soupy) if you want a more watery curry and lesser water if you'd like a thicker curry. Personally, I like it somewhere in between. 5. Adjust the spices to suit your taste buds. If you prefer the dish to be spicier, use more dried chilies. And for a more sour taste, add more tamarind water into the curry. This sounds so delicious! I love tamarind and fish together. However, I do not enjoy making the tamarind extract from the fresh tamarind. Great recipe, I can’t wait to give it a try! I had no idea you can make soup with Tamarind. My family has a Tamarind tree and they just make juice. Oh, I’m definitely going to try that soup, especially since I’m a soup lover. I’d eat it everyday if I could, different kinds, soups, chowders, you name it! Thank you so much for sharing this! A great and useful website where I can learn all I care about the subject . You really have a lot of interesting information . I’m glad I found you and I definitely became your reader! thanks! Wow, I wanted to try something different for a while and this seems the perfect opportunity. I literally cant wait to get my hands on all the ingredients and start cooking! You’re welcome and happy cooking! The look of the spices frying up in the pot is so mouth watering. I bet this is a great asam dish. Mackerel is always my choice of fish when it comes to curry dishes but lady’s finger, not so. What other vegetable choices would you recommend to go with asam curries? Thank you for sharing this delicious recipe. Besides lady’s fingers, you can also use brinjals (eggplant) and tomatoes. Hi Yvonne, you always have such great recipes for the carnivores but what about fellow vegetarians like me? I will keep bothering you until you give me your favorite veggie recipe. Good job with the images, you seem to be a real good food photographer! I’m usually not one to like curries but since my girlfriend and I cook dinner at home every night we are always looking for something new to try. The Asam Pedas Ikan looks amazing and I enjoy all of the ingredients that were put in the dish separately so I think we are going to have to give it a try! My girlfriend is very sensitive to spicy foods so how overpowering would you say the spice is of this dish? I would say for someone who enjoys spicy food, this dish would be moderately spicy if you follow the recipe. You can always adjust the amount of dried chilies used if you don’t really like spicy food. What a great dish! My mouth is actually melting right now, I love seafood and spicy food. Thank you for sharing the recipe, I am giving it to me wife and I am going to make her read your post. I am bookmarking your page since I will be coming here regularly for more recipes. Hi Yvonne, your passion certainly shines through here. You are much better at cooking than me, my hubby does most of the cooking in our house. He likes to cook in large batches and freeze it. Is this recipe ok for freezing? What do you recommend? Sorry I missed your comment! You can freeze the blended paste and thaw it when needed. As for the dish, I have not tried to freeze it before but I did kept in the fridge and ate it the day after. I suppose you can freeze it too. Excellent recipe, well written and easy to follow instructions, although I am not a great fish lover I would imagine you can substitute the fish for a meat dish. I do enjoy any food with chilies and garlic in. Although my misses is not so impressed. Yes, you can substitute the fish with chicken although fish is a more popular choice for Asam Pedas. This certainly looks like a very interesting dish. I am sure my hubby will love this, he loves seafood as well as dishes that are hot and spicy.